This Halloween part ideas post has been inspired by a product I received to review at no charge but all opinions expressed here are my own. Prom dresses can be found at Good Will, thrift stores, or the closets of friends and neighbors. We actually found an old wedding dress at Good Will and had a few alterations done. Throw in a few scary accessories and our Paranormal Prom costume was complete! Some of the girls came in long, flowing vampire dresses, the smaller girls had dresses on that looked like they had been worn as flower girl dresses in a wedding. Basically, anything formal will do and you don’t have to spend a lot of money on it. If you want to use the gown again, hotglue pins to plastic bugs and attach them to the dress. If you never want to use the dress again you can get creative with fake blood. Jewelery making: Dollar store beads (plus a few donations) and thin string were all that was needed. 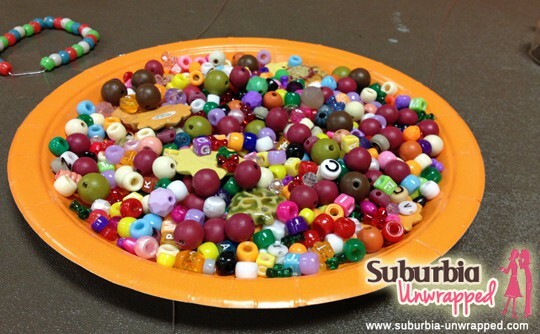 Tape down one of the ends of string to the table to ensure that not too many beads end up on the floor! The girls made bracelets but you could do necklaces too, depending on how many girls you have and how many beads. Make a corsage: This was truly a brilliant idea! Supplies included a few packages of black hair bands (easily found at most chain drug stores), small fake flowers from the craft store and floral tape (also found at the craft store). Using a pair of scissors, cut off a stem or two of the flowers and tape them onto the hair band. The band goes around your wrist like a wrist corsage. Inexpensive and easy enough for even the younger girls to do without much help! Pin the Tie on the Date: This is one of the Halloween party ideas that my daughter was in charge of putting together. Basically, all you need are a few pieces of poster board, markers or paints, scissors, double sided sticky tape and a bandana. Draw a ‘date’ on a piece of poster board and color him in…give him a nice formal look with a top hat and button down shirt. 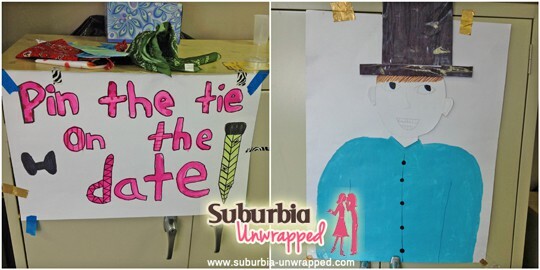 Next, make him a tie on a piece of poster board using a tie template. Give it a bit of color. To play the game, just tape your ‘date’ to a wall, blindfold your prom queen and hand her a tie with some double sided sticky tape on it. Just like pin the tail on the donkey with a bit of a twist! Fashion Doll Ring Toss: Most girls probably have a few Barbies tucked away in a bucket still at this age so just get one or two out and dress them up in something pretty. Doesn’t Barbie always have a pretty gown in her closet? Next, tape her feet to the bucket so she is standing upright like in the picture above. Weight down the bucket with a few cans. 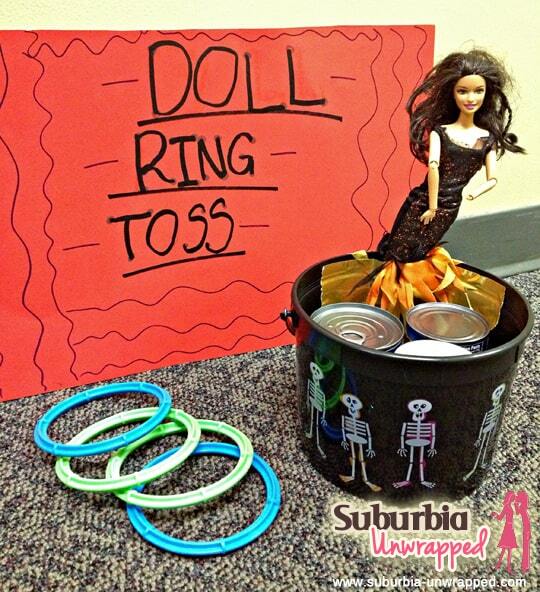 Grab a few rings from the pool toy bin and you are all set to play Fashion Doll Ring Toss! Prizes can be small plastic rings, pieces of candy, etc. There were dozens of games, activities, and assorted centers for the girls to stop by and participate in. We did a colored hair spray station, a ghoulish makeup table, musical chairs with Halloween music, and even a photo booth that was a big hit with the girls. 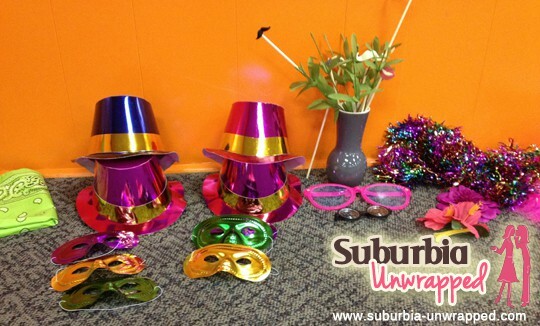 Gather a few props like sparkly feather boas, crowns, hats, jewelry, gloves and whatever other accessories you can find in the dress up bin. You can paint a pretty backdrop on butcher paper or just hang a pretty blanket from the wall. Our troop leader’s high school son dressed up with a scary mask and fancy suit to act as the ‘prom date’ and we took photos of the girls as mementos. 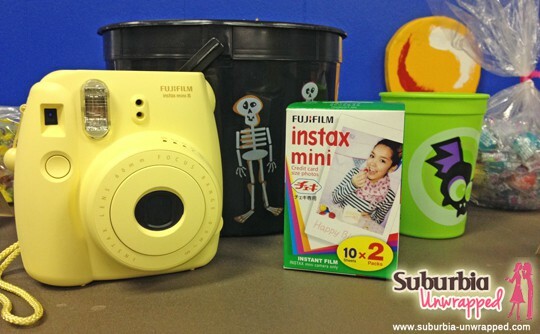 We took photos with a digital camera so that the girls could access them online but if you want to actually hand the girls a photo before they leave you may want to consider the Fuji instax mini 8 camera. Remember when we were young and you could snap a picture and have it print right from the camera? That technology is still around, even though most people now use digital. This camera has a cute and compact body design and comes in five different colors. The camera is incredibly easy to use and set up. It takes 2 double A batteries and uses a special film cartridge pack that you can buy online. Just put the cartridge in the camera and you are ready to start taking pictures. What I loved about the Fujifilm Instax Mini 8 is that it automatically determines the best brightness for taking a picture. There is no guesswork involved. It will tell you the right setting by lighting the corresponding lamp on the front of the camera. The picture that prints out is 62 x 46mm…or, about the size of a business card. 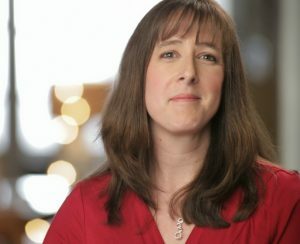 Once the photo emerges from the camera it only takes a minute or two to finish developing. The instax mini was easy to set up, light weight, and choosing the right setting was very simple. We found that the pictures came out a little dark under the horrid fluorescent lights of the large room we were in, but then again I never have great luck with pictures under fluorescent lights! The photos came out much brighter when we went outside and I was impressed with how quickly they developed as well. This camera would make a great addition to your photo booth at your next party and that way the kids leave with a photo in hand to remind them of the fun they had. Have any other great Halloween party ideas that would fit for a Paranormal Prom? Getting a costume from a second hand store is such a great idea. They are usually only worn for one night anyway. Unless of course it is my kids and they wear costumes year round LOL! Great idea to go to a thrift store. I never thought to do that for costumes. And I love the paranormal idea, except for zombies. They are the only paranormal creatures that scare me. 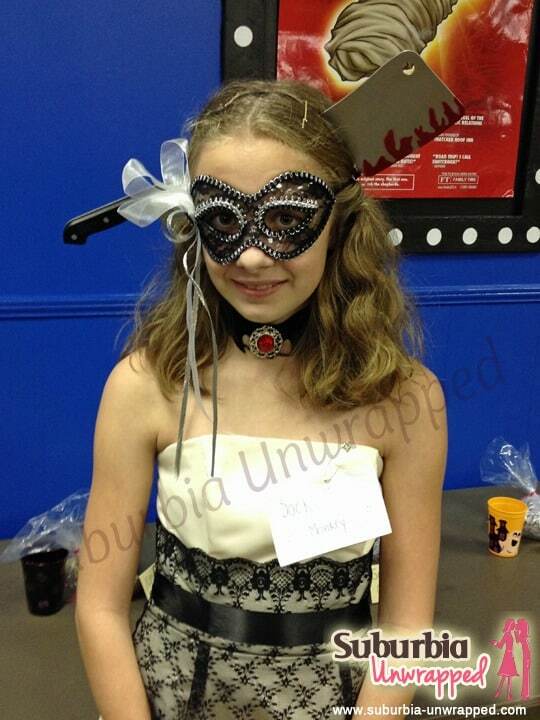 What a really fabulous idea for a Halloween party for tweens/teens! I'm sure they'd have a great time and it's not so "kiddish"!